The great city of Ebora once glittered with gold. Now its streets are stalked by wolves. Tormalin the Oathless has no taste for sitting around waiting to die while the realm of his storied ancestors falls to pieces - talk about a guilt trip. Better to be amongst the living, where there are taverns full of women and wine. When eccentric explorer, Lady Vincenza 'Vintage' de Grazon, offers him employment, he sees an easy way out. Even when they are joined by a fugitive witch with a tendency to set things on fire, the prospect of facing down monsters and retrieving ancient artefacts is preferable to the abomination he left behind. But not everyone is willing to let the Eboran empire collapse, and the adventurers are quickly drawn into a tangled conspiracy of magic and war. Jen Williams, acclaimed author of The Copper Cat trilogy, featuring The Copper Promise, The Iron Ghost and The Silver Tide, returns with the first in a blistering new trilogy. 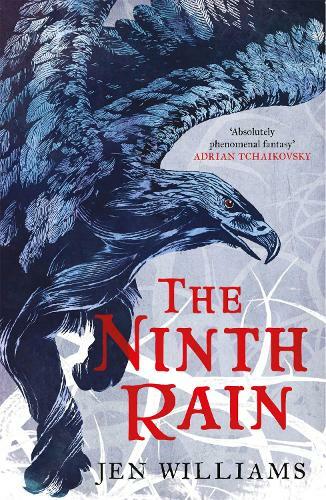 In The Ninth Rain, first in The Winnowing Flame Trilogy, Jen Williams brings a fresh and unique story to the fantasy genre; a book that strides across epic fantasy and probes the boundaries into sci-fi.